You may think hosting an epic tailgate is as simple as showing up with a grill and some snacks, but here at Dallas Lease Returns, we know that is not the case! 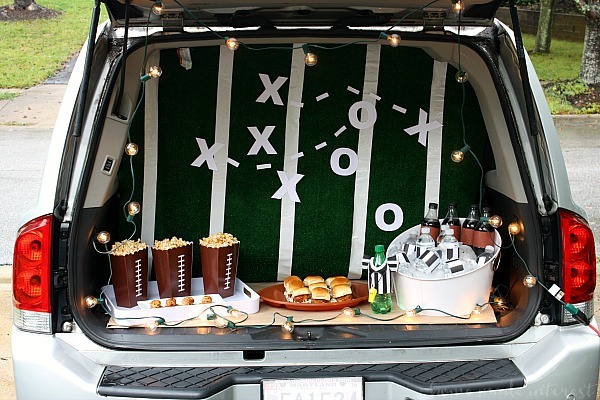 Creating a fun and memorable tailgate is ALL about the prep! With a few tips, tricks, and some smart space-saving gear, you’ll be well on your way to game day success—no matter who wins on the field. Tailgating is all about carving out your own small patch of pre-game party perfection. And that means you’ve got to set the mood! For starters, it’s never a bad idea to show a bit of team spirit while staking out your space. File this under killing-two-birds-with-one-stone, because not only does this portable and affordable canopy pop out instantly to provide shade and shelter, it also comes in over 20 colors so that you’re sure to rep your team right. Plus, it folds into a carry-bag, giving you trunk space to spare. Also, music is a MUST! A Bluetooth speaker that’s small enough to slip into your pocket (but loud enough to drown out any opposing fans) is perfect to set the mood! The UE Roll 2 may look petite, but this thing packs nine hours of battery life, killer sound, and a waterproof design—just in case someone knocks it into the cooler. For starters, plan on doing as much prep-work as possible. Our advice? We like to choose one meal to prepare on site, and pack along a number of prepared sides for all-day munching. Whether you’re into bread bowls or fruit salads, bruschetta or hummus—the more you can organize in advance, the better. Tailgating is all about endurance, and that’s why you should NEVER skimp on comfort! Besides, wouldn’t you rather sit down at a table tto enjoy snacks than stand? That’s where the folding picnic table comes in. This portable diner’s companion expands from a travel-friendly (and sweet looking) carrying case into a four-seater table. If you like your seating with a bit more padding, there’s also this incredible portable couch, which is briefcase-sized in transport before folding out into a snug loveseat. As the season goes on, you’ll definitely need some warm gear to ward off the Fall chill! You can’t go wrong with throwing a few waterproof wool blankets in your car, but if you’re more of a modern traveler, splurge on these Bluetooth heated insoles. Have anymore tailgating hacks? Drop them in our comments below! Or if you’re in need of the perfect tailgating vehicle, come check out our inventory today!